The purpose of this document is the training of engineers and contractors in the use of DeepEX – shoring design software. The document presents in detail how to define different parameters and settings in the program, how to simulate different conditions and how to perform analysis and evaluate the software results. In several occasions, the document incorporates the software development team recommendations based on our deep excavations and foundations design experience, as well as, our technical support team experience with our customers’ design issues and frequently asked questions. Our company’s mission is the development of user-friendly, high-quality, integrated deep excavation calculation and design software. We offer multiple accepted design methods, as well as training and support of users in the adequate use of this software, with the ultimate purpose of making computerized simulations available worldwide for practical application in the wider geotechnical engineering and consulting field. In that sense, we believe that such a manual would be useful for both new and experienced users, who wish to get the most out of DeepEX. The software version DeepEX 2019 was used for the descriptions and Figures in this manual (current version during the document creation period). This manual will be adjusted and updated for any upcoming software versions and modifications. The partial dialog interfaces, the main software interface and the available methods, tools and capabilities might differ in older versions, since we constantly update the software, adding new tools and features and improving the already developed ones. This manual is created in a book-style format. All Sections and Subsections are numbered to assist you recognize the context and navigate through the guide sections. This section presents all the tools and functions to create a 2D excavation model on the model area graphically (define soil properties and stratigraphy, define and use supports, perform excavations and more). This section presents information about the several analysis option that can be selected and assigned on a model in DeepEX (analysis methods, design standards, soil pressures, beam analysis methods and more). This section presents how we can review and evaluate the software results, how to optimize the model manually or with the automatic optimization tools and how to use the report manager to edit and export reports. This section presents how to use the DeepEX model wizard and the voice commands to create any deep excavation model in minutes. The model is generated with all construction stages, saving a lot of time and effort. This section presents the standard procedure to create typical models in DeepEX. 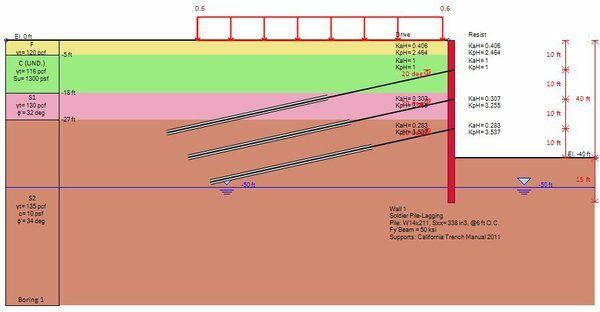 This section presents how to perform slope stability analysis and use soil nails in DeepEX. This section presents the use of the Cost Estimation, Export Drawings to DXF, 3D Frame Analysis, Export Holographic 3D Models and Building Damage Assessment modules of DeepEX. This section presents how to use the Gravity Retaining Walls and Pile Supported Abutments additional optional modules of DeepEX in order to create and analyze such models.